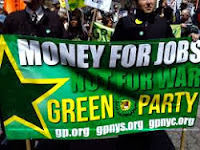 Lost amid the carnival of embarrassments that is the Republican presidential primary is the fact that there is another primary race underway: the Green Party’s. “What?” you say. “Those guys are still around?” Well yes, but they’re not guys. Lest you think this is all rainbows and ponies, however, Stein is not messing around. She says she became involved in politics after witnessing firsthand the epidemics of obesity, diabetes, learning disorders, autism — problems that she traces to toxic chemicals, an industrial food system, and a society built around the automobile. Stein’s presidential platform includes universal health care, tuition-free higher education, and forgiveness of student debt. And at the center of it all is a Green New Deal that she says will put millions of people to work, tackle the climate crisis, and address our failing health as well. The Green Party will choose its candidate for president at a national convention in Baltimore in July. If things continue as they have been, Stein will win the spot handily. (She has won 10 of 10 state primaries, plus the District of Columbia.) I talked with her earlier this week. Q. Your website today says Mitt Romney has invited you to debate him. It’s an April Fools’ joke, right? A. Well, that part of it is a joke. He did not invite us. But the rest of it is actually true. I have debated him [during the 2002 race for Massachusetts governor], and I was declared winner by more than one objective source. Q. Did someone really say you were the only adult in the room? A. Yes, that was an editorial in the Boston Globe, and if you watch the debate you’ll see why. Q. Doesn’t a sense of humor automatically disqualify you from the presidency? A. A sense of humor and lack of corporate funding are substantial obstacles. But I think that we’re part of a very large movement to change the way that politics works — so that the joke is no longer on us. Q. 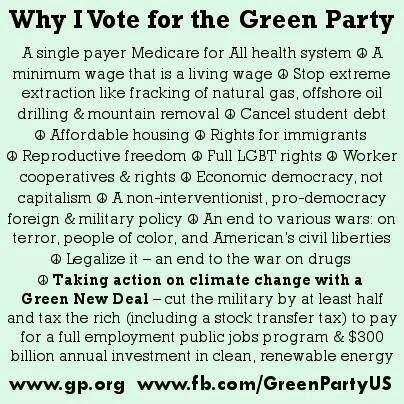 Running for president under the Green Party banner, your motivations have to be something besides actually landing in the White House. I assume your campaign is largely an effort to change the system. A. That’s right, and a journey begins with the first step. That said, no one in their right mind ever expected that young people in the streets were going to give the boot to an entrenched dictator, either in Egypt or in Tunisia. So remarkable things have been happening, likewise with the Occupy movement. There is enormous public will out there for substantive change. The solutions that we are promoting — we don’t need to convince people that we need a climate we can live in, that we need health care as a human right, that we need to be creating jobs rather than just giving more tax breaks and giveaways to CEOs who just pocket the change — these are solutions that people already support. The question is whether we can actually harness our political system and move them forward. Q. As disappointing as Obama has been, there’s a lot at stake in this election. Why should voters give you a vote when we could end up with a situation like we saw with Ralph Nader and Al Gore in 2000? A. Progressives have been told we dare not vote for our values and our vision because dangerous things will happen — witness Ralph Nader. We have 10 years of experience with muzzling ourselves politically, and it’s very clear now that silence has not been an effective political strategy, and that the politics of fear in fact has delivered all those things that we were afraid of. Obama has basically embraced most of Bush’s policies, including drill baby drill, pro-nuke, pro-coal, undermining the Durban [climate] accords. He’s celebrating the beginnings of the Keystone pipeline. We still have twice as many troops in Afghanistan as we had under George Bush. The only reason Obama withdrew from Iraq was because he was unable to negotiate immunity for the troops, so he wound up having to accept what was George Bush’s timeline for withdrawal. So the point here is that by being quiet, we have essentially allowed corporations to run government whole hog. Obama has been very responsive to his corporate sponsors. So it’s really critical that we have an opposition voice. Q. In how many states are you even on the ballot? A. We’re currently on in 20 states. We expect to be on the ballot in 46, maybe 48 states. We do have some very difficult states — two that are impossible barring millions and millions of dollars. Q. Is there any hope of getting you into a real debate? A. Absolutely. The Commission on Presidential Debates has a standard, which is 15 percent [of the national electorate, as determined by public opinion polls]. If everybody who cared about the climate got on board and actually stood up and said that they’re supporting this campaign, that alone might be enough to get us into the debates. If all the students out there who are up to their eyeballs in debt stood up for this campaign, we would easily be at 15 percent. Q. 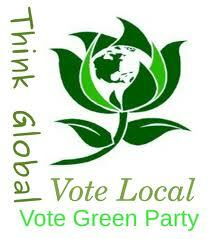 Is the Green Party itself something of a kiss of death in this country right now? A. We ran a referendum here in Massachusetts — I’m talking about the Green Party along with some nonprofits. The referendum was non-binding. We basically proposed redefining economic development to be green, sustainable, re-localized, and healthy, and to create local small businesses and cooperatives in the green sectors of the economy, rather than just dishing out billions to multinational corporations that are part of the old fossil fuel economy. We didn’t have money to spend on the referendum. We were hoping maybe we could get 10 or 15 percent [of the vote]. We actually got between 85 and 95 percent in every community — not just the treehuggers, but also the postindustrial, desperately poor urban communities as well. To me, it confirmed what I find in my everyday experience: People are into this. They get it. Q. You’re using the same model for the Green New Deal you’re pushing on the national level. Tell us about that. A. It’s an emergency solution that will put 25 million people back to work, end unemployment, jump-start the green economy for the 21st century, and substantively combat climate change. It would put communities in charge of defining what jobs they need. These jobs would be community-based, living-wage, full-time jobs, and would basically run the spectrum of jobs that make communities sustainable — clean manufacturing, local organic agriculture, public transportation, energy-efficient as well as active transportation, and of course clean renewable energy, conservation, weatherization, efficiency. We would also include teachers, nurses, day care, violence prevention, drug rehabilitation, affordable housing construction, etc., so there would be a spectrum of jobs that make our communities environmentally, socially, and economically sustainable. The cost would be on the order of the first stimulus package, but it would create a whole lot more jobs, because the first stimulus package was largely tax breaks and subsidies for large corporations. Q. I think a lot of working people feel burned by the green economy because we didn’t see the jobs that people like Van Jones were promising — certainly not right away. A. It’s not only the green jobs that failed. Obama’s promotion of additional free trade agreements has been devastating to working people. He has not delivered on the Employee Free Choice Act. He has not stood up to the so-called “right to work” states, which actually undermine not only worker pay but also safety on the job. Obama’s first appointments were Larry Summers, who laid the foundation for Wall Street’s waste, fraud, and abuse. He then went on to appoint Timothy Geithner to be head of the Treasury, who had headed the New York Fed while all that was going on. And then he brought in Jeff Immelt, the king of layoffs and factory closures. The head of GE was brought in to head Obama’s jobs council — the guy who had off-shored more jobs than any single person in America was brought in to head the Obama jobs program. So it’s no wonder that working people are very skeptical of whatever Obama’s going to propose. And I think vote for him only out of fear. And that’s where Alice Walker comes in again, that the biggest way people give up power is by not knowing they have it. Q. Last question: How do you travel on the campaign trail? Humvee? Private jet? A. My dream is to get a veggie-oil bus. I take the train whenever I can. When there’s no choice, I fly, and when we drive, we drive in a Prius. So we don’t just talk the talk, we walk the walk all the way.